Here are some thoughts for teaching players to space after the ball is passed to the low post. It is a part of this week’s eBook bundle along with Jimmie Oakman’s Packline Defense. Regardless of what offensive system you employ, you might be able to use these ideas, or use them for thoughts to develop feed and space rules that best fit your team. You can find out more about the eBook bundle: at this link: Packline Defense and Swing Offense. The wing that feeds the post cuts thru, “CUTTING TO CATCH” and the other perimeter players will fill the next spot. NOTE: this option is used versus teams that are playing tight and not digging in on the low post. Here 1 feeds the post and cuts. 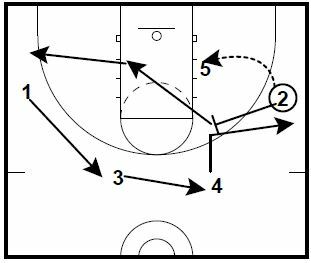 2 moves form alley to slot. 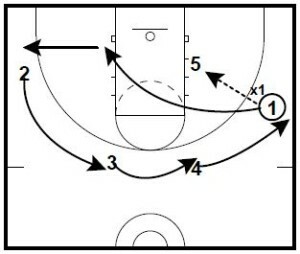 NOTE: This option is usually used against teams that try to dig in on the post with the ball side defenders. The next player, 4, will dive to the rim and out. 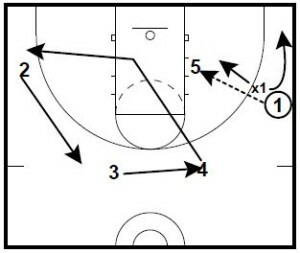 Here 2 will feed 5 and screen at the elbow for the next guard. 4 will move to the elbow and read his defender. Here 4 comes out, so 2 willl dive to the rim. 3 and 1 will move up. These 3 options are from Trey Watt’s eBook on the “Versatile Swing Offense.” It is a part of this week’s eBook bundle along with Jimmie Oakman’s Packline Defense.